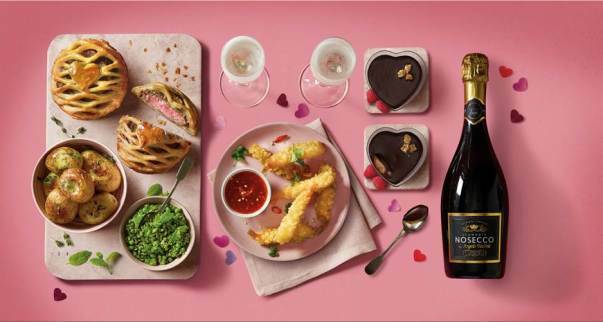 I think that traditions have changed around Valentine's Day – staying in has become the new going out with more and more people recognising they can celebrate just as well at home thanks to our fantastic Extra Special Valentine’s meal deal. Staying in with the one you love is romantic, not an afterthought, and it’s much kinder on the purse strings too. Our meal deal is such good value and quality, why wouldn't you enjoy a little bit of indulgence on a special night in the comfort of your own home? The deal is just £15 and you get a starter, main, two sides, dessert and a drink to suit most tastes, with options like wine, beer, Prosecco, Cava, non-alcoholic Nosecco or soft drinks like Fentiman’s Lemonade. There are some fantastic dishes to choose from, including Sirloin Steaks with heart-shaped Pink Prosecco Butter, Hand-Finished Beef Wellingtons (a personal favourite of mine!) and a delicious Smoked Salmon En Croûte. If you're looking to enjoy a vegan alternative meal this Valentine's Day you can pick up our Beetroot & Spinach Melts to start, followed by our delicious Portobello Mushroom & Lentil Gratin and sides like Smoked Paprika Fries or a Pea Crush. Then top it all off with our indulgent Salted Caramel & Dark Chocolate Vegan Hearts for dessert. For us it was really important that we feature inclusive options in the range. It’s important that for whatever reason, if it’s dietary or lifestyle, there are still dishes that meet people's diverse needs without compromising on flavour. Our Extra Special Range gives customers a premium option all year round, but we love to go the extra mile to make it really special on Valentine’s Day. For example, our Beef Wellingtons are topped with a little pastry heart or our Profiteroles are finished with pink and white sugared hearts. The individual Lemon Meringue Pies are exceptional, with individually piped meringue peaks on a juicy lemon filling; the perfect sweet for your sweet. As part of my role for the chilled meal solutions category I look to be the eyes and ears of our customers, to ensure we're providing the right products at the right quality and price. We have a fantastic product manager for Extra Special, Anna Schofield, and buyer on the range, Nicola Lees, who've both worked tirelessly to bring the Valentine’s Meal Deal to life. We improve and tweak the range every year, and we think 2019 is one of our best offers yet.